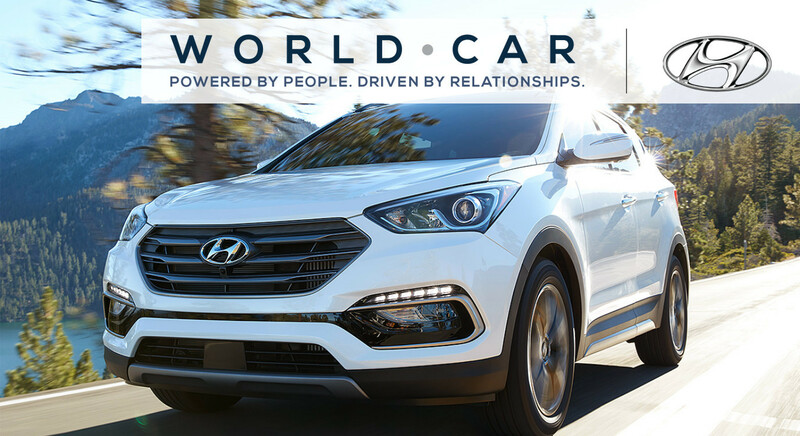 When you buy your next NEW Hyundai with World Car Hyundai, you will receive the World Car Value Package at NO Additional Charge! We offer our customers something that no one else does. When you buy a new Hyundai you get the exclusive Lifetime Powertrain Limited Warranty at no additional charge! The World Car Lifetime Powertrain Limited Warranty will cover repairs at no charge to the buyer and is accepted throughout the country in all 50 states. What is Protected under the Roadside Assistance Program? Just about anything that prevents you from driving off in your vehicle - If you run out of gas, lock your keys in your car, have a dead battery, broken hose or your car won't start, Roadside Assistance will take care of you. It is good in all 50 states. Welcome to World Car Hyundai's website! We are a large local Hyundai dealer, located near Pharr, TX. We service Pharr, TX for all individuals looking to buy or service their new or used Hyundai. World Car Hyundai carries a wide selection of new Hyundai vehicles near Pharr, TX. Shop our website's New Hyundai inventory here: New Hyundai Models. Shop our website's used Hyundai inventory here: Used Hyundai Models. World Car Hyundai has an abundance of Hyundai vehicles near Pharr, TX. Our sales representatives ensure that you receive the customer service that you deserve. When you walk in our Hyundai dealership near Pharr, TX you will see a true difference. We know you'll find the perfect Hyundai, new or used, near Pharr, TX. So remember, when you are looking for a Hyundai, World Car Hyundai near Pharr, TX is the dealership for you! We look forward to your visit with us! World Car Hyundai is your premier choice to service your Hyundai. We have over 15 years of experience in servicing Hyundai vehicles. Our expertise is one of the reasons our customers return to World Car Hyundai for their Hyundai repair. World Car Hyundai has the best options for you when it comes to Hyundai service for Pharr, TX. We will give you the professional treatment and friendly atmosphere at World Car Hyundai. When the time does come for you to order Hyundai parts, our Hyundai dealership serving Pharr, TX has the Hyundai parts for you! One of the most important aspects of a customer servicing dealership is making sure that you get what you want and what you need! With shipping options available and a large amount of Hyundai parts on hand, our parts department takes pride in knowing we can do just that at our Hyundai dealership near Pharr, TX. World Car Hyundai is the premier Hyundai dealer in San Antonio, TX and is just a short drive from Pharr, TX. World Car Hyundai in San Antonio, TX, serving Pharr, TX and surrounding areas for all of your Hyundai Sales, Service and Parts!